We headed out early on Sunday morning so we could get to our cabin in Grand Marais, Michigan and have some time to check the place out. 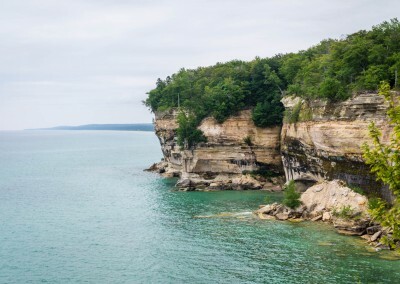 Being that we’d never been to Pictured Rocks we had no idea what to expect, but I had researched the best places to photograph. Hurricane Beach was one that seemed popular which proved easy to understand. The Hurricane River flows out of the woods right into Lake Superior, and is positioned to offer the possibility of a nice sunset shot. This particular evening didn’t offer the most stunning sunset but the water was refreshing and the beach itself was amazing. The beach is a mix of sand and stones littering a base of sandstone, and the sun shone on the low sandstone cliff highlighting its textured surface. It’s fascinating how trees and vegetation can grow at the edge of these sandstone ledges. Upon entering the water we noticed very quickly how different this beach was from what we’re used to in Lake Michigan. The floor of Lake Superior varied from stones to sand to sandstone which gave us to feeling of walking in a swimming pool. No matter how far we went out into the water we could easily see the bottom through the crystal clear water. Sunset came, and it was time to head to our cabin for the night. Tomorrow was going to be a big day. Early the next morning we headed to the Miner’s trail area to see Miner’s Falls and Miner’s Castle. The hike to Miner’s Falls was uneventful yet pretty, but the falls themselves were an amazing 50 feet of water pouring over a sandstone outcrop. After returning to the trailhead we headed to Miner’s Castle, a 1.2 mile round trip on pavement which made more of a nice walk than a hike. Our afternoon goal was to hike along the cliffs at Beaver Basin toward Spray Falls. We knew this would be a long hike; in total we tramped 10 miles much of which was on the edge of 200’ cliffs, not a place for those with unsure steps or acrophobia. Along the way we were privileged to view beautiful sandstone coves with clear blue water, and in one spot sandstone laced with blowholes formed by the pounding waves. Spray falls itself is 70 feet of water pouring right into Lake Superior. It was worth every step! 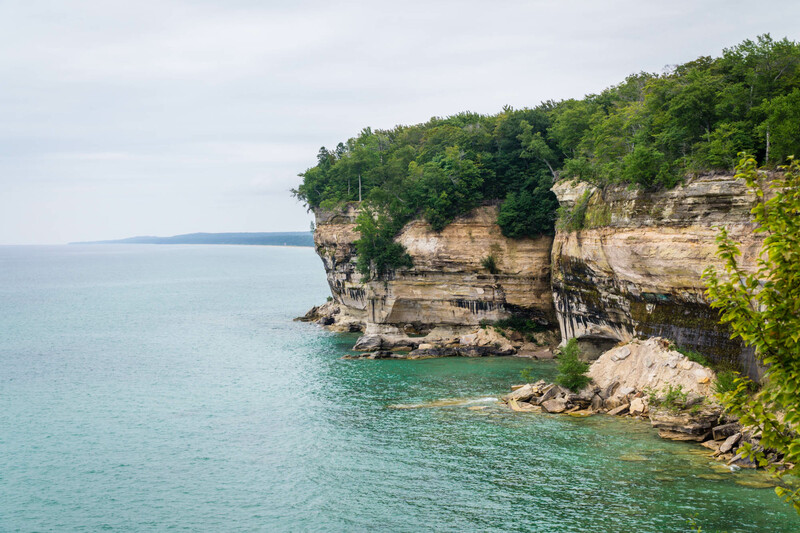 There are only a few places on the Pictured Rocks lakeshore where the beach is in close enough proximity to a parking lot to be a convenient kayak launch site. The plan for this day was to put in at Miner’s Beach, and then paddle east to Mosquito Beach, about ___ miles away. The real goal was Lover’s Leap but I knew that ___ more miles, depending on water conditions, could be setting the bar too high. We set out for Mosquito Beach with overcast skies and relatively calm waters. Rounding the first cliff we could not believe the beauty created by the mineral-laden water pouring down the rock, shaping and indeed painting it. The cliffs are decked out in reds, oranges, greens, white and black and look amazing against the water which seemed like a blue-green colored gemstone. Only in a kayak can one experience the pictured rocks like this! Past a couple more points and a lot of great scenery was Mosquito Beach, where we had a little more sunshine and relatively fewer clouds. We stopped for a snack and everyone was feeling good so we decided to continue on to Lover’s Leap. Now Lover’s Leap is named for the outcropping on the cliff high above the water, but the cool formation is really the archway under the cliff. Past this were a couple of caves, one less significant and the grander Rainbow cave. Achieving this distance was a big surprise, and I’m so proud of my kids for the accomplishment. The plan today was to hike to Chapel Rock, rest a bit at Chapel Beach, and then either continue on or to head back. About one mile into the hike the rain started, and much to my wife’s dismay it continued all the way to Chapel Rock. This near misadventure was saved by the appearance of the sun on our arrival at the beach, where we remained long enough to lose our excess moisture. The scenery here was dominated by the tree on the rock and serenaded by the Chapel River tumbling into Lake Superior. Alas, the dry weather was not to stay. As soon as we resumed our hike the rain returned but fortunately much more lightly, allowing us a pleasant return trek to the trailhead. On our way to our next stop we waylaid ourselves with the Tahquamenon Falls. Here one will find undemanding pathways and well thought-out vantage points of the upper and lower falls. It is even possible to go into the water at the lower falls, which some had taken advantage of even in the pouring rain. From Tahquamenon it is a short drive to Whitefish Point which I would recommend on any dry day. We made our base camp at St. Ignace for the next couple of days to take advantage of views of the Mackinaw Bridge, the fort on Mackinac Island, and friends around the campfire. I also discovered an interesting lighthouse in St. Ignace with an even more interesting name, Wawatam. I ventured out early on a sunlit morning to capture its image against the blue sky. That afternoon we boarded a ferry to Mackinac Island to do some sightseeing. For those of you who are not familiar with it, there are no motor vehicles on the Island, the main forms of transportation being bicycles and horse-drawn carriages. All sorts of merchandise and sundry items are shipped to Mackinac Island by ferry and carted to its final destination on wagons drawn by members of the equine family. Fort Mackinac is a first-class act with some great old buildings and well-preserved history, not to mention some fine views of Lake Huron and the mainland. Mackinac Island is a fun place to visit, and make sure to enjoy the fudge while you are there.